The Family Support Center (FSC) continues to work in the area of family formation through adoption. As you may know, the project is being promoted by the Talgar Municipality. The idea being, to create a meeting and training program for all couples in the province and region who have reached out to the State with the intention of fostering or adopting children. Couples who wish to foster or adopt a child can work with the FSC to determine if fostering and/or adoption is the right path for them. Sometimes we have couples who visit the Ark and want to take part in the work by adopting or fostering. It is very important that during the training period the potential parents-to-be realize the challenges, the importance of this decision, and the impact and responsibility they will have on another human being. In the end, some decide to proceed and some realize that their path was a different one. But all leave enriched by the experience. Summer at the Village, should come with a sign: “Construction in Progress”. One day, it might be the thermal insulation project, completed thanks to the active support of the German organization Renovabis, who last year financed the photovoltaic plant. Or it might be the repair of the artesian well pipes, partially dug thanks to a group of amateur Ark Archaeologists… Or the seemingly never-ending cleaning of the land and woods surrounding the Ark, sometimes with the welcome help of friends passing by. And then of course, the indoor maintenance works, especially for houses beginning to show their age. Bu we can relax now because we are positive and optimistic that after a good hardworking summer we are ready to face winter hassle-free. We would like to point out a new addition in the Ark Village facilities. We are talking about a brand-new gazebo given by Medet. He wished to give a gift to the Ark Village using the money he receives from the state and what he earns through the tailor workshop. After some thoughts, he decided on a gazebo. It was made by a craftsman in Talgar and it has been very much appreciated by everyone in the community, especially the little ones. Summer is not only work of course. It is mainly outdoor fun with our friends. It is impossible to list all the activities and friends that were guests or organizers of all the gatherings, parties, sports events, and trips we had this summer. A great summer, filled with joy! The last two weeks of summer are mostly focused on the beginning of the school year. Our friends start well in advance to mobilize resources to guarantee that everyone is properly equipped for the first day of school. They provide uniforms, school supplies, and text books. There are companies who contribute significantly as well as individuals and groups who “adopt a pupil” to make him/her ready from A to Z. Thank you to everyone for such a great job. Anvar had a very intense summer. As we wrote in the last issue, he started a new job outside the Ark in a textile clothing manufacturing company in Talgar. After a certain time we talked together about the next steps and we have all agreed that the best was to continue his education. Therefore, he has enrolled in an evening school to obtain a diploma that will help him proceed in his career path and future endeavors. The last man of Ark Village’s first generation got married! 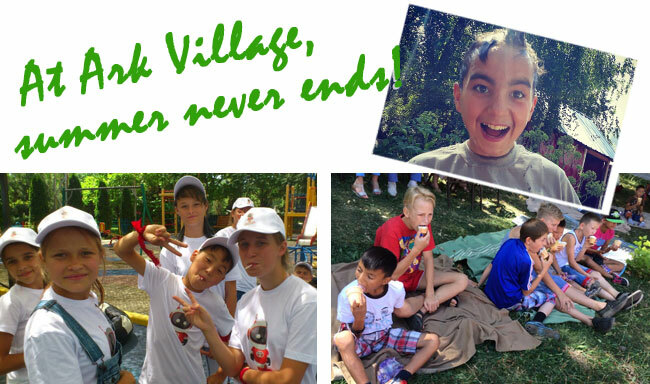 Dima was one of the first children that 20 years ago joined us at the Ark Village in Almaty. Until now, he was the only one not married, despite several years of engagement with Nastya. Now the big day has arrived. He worked for many years as a maintenance person at the Ark and then for the national Kazakh airline, Air Astana. Dima has always been a model for the boys at the Village. Nastya on the other hand, was the same for the girls. She studied Nursing, worked in a hospital, and now she is working at Caritas Almaty as co-coordinator of the rehabilitation project for children with Downs Syndrome. It is a great example to the community of the educational and humanitarian work we try to do every day. To see two beautiful people grow and turn out happy and with a future is indeed a great joy for the heart. Two people showing strength, determination, and a clear view of their goals and how to reach them.